Please note that these materials are only suggested and supplementary and our inclusion of them is not an endorsement or guarantee of exam success. GOAL for Exam FM: Online exam practice with three modes, study, quiz and simulated exams. You can choose your level and syllabus topics. 2 Week Free Trial available at The Actuarial Bookstore or ACTEX | Mad River Books. Rethink Studying has loads of free advice and resources specifically for passing actuarial exams. 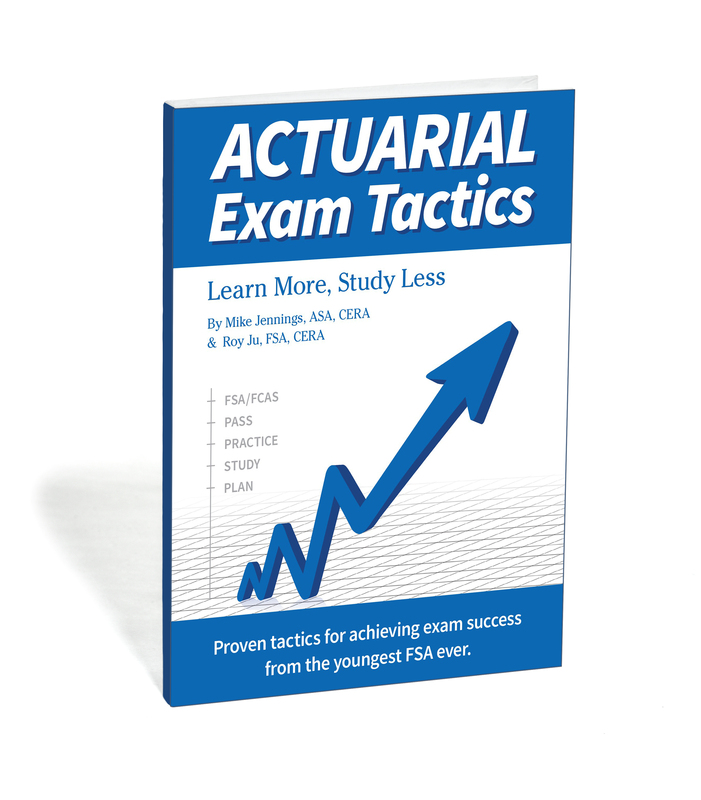 It’s run by Mike Jennings & Roy Ju, the authors of Actuarial Exam Tactics. Roy is the youngest person to ever achieve his FSA, at age 20. Making the Grade Free eBOOK: The Aspiring Actuary’s Guidebook to Consistent Exam Success and Advancement in the Workplace. ACTEX Learning has made this book available as a free PDF: link to download Free ebook. Did we mention the entire book is FREE? Its primary focus is on suggested techniques to use in order to maximize success on the exams. The 4th Edition was updated to address changes in the SOA and CAS credentialing options and requirements. SOA – Online Sample Exams P & FM – The SOA now offers online sample exams for exams P & FM. No word yet on whether additional sample exams will be added. These are free and provide an online exam experience that allows students to experience the Computer Based Testing used in most of the SOA’s preliminary exams. CAS Student Central – Study guides, sample tests, and time management tips available, students must sign up for an account on the website to access the materials: http://www.casstudentcentral.org/study-tools/ CAS Student Central Members are provided access to free practice exams for P & FM from the Infinite Actuary, with exclusive access to two additional sample exams beyond those already offered on TIA’s website. Howard Mahler – sample study guides and test prep available on his website. Candidates should be aware that exam syllabi are constantly evolving and therefore not every prior question is relevant for the current exam. Even so, the questions and solutions do provide guidance regarding the type of questions asked and appropriate responses.